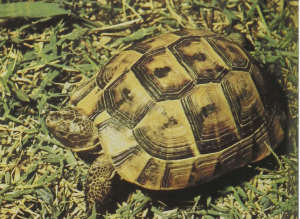 This is one of several Mediterranean tortoises or land turtles whose range extends from northern Africa across Asia Minor into Iran and southern Russia. They have long been kept as pets in northern Europe. These are tortoises with a thick, hard, unhinged shell, attractively marked with various designs of browns, tans, and white. The two openings in the shell are blocked by folding the limbs inward; the projecting portions of the animal bear thick spines of bone and keratin. Such turtles are called tortoises in Europe while many of the semi- aquatic species are referred to as terrapins there. Unfortunately, there are fewer common names than there are groups of turtles.